Image obtained with ESO's Very Large Telescope (VLT) of the spiral galaxy observed by the European Commissioner for Science and Research, Janez Potocnik, when at Paranal. 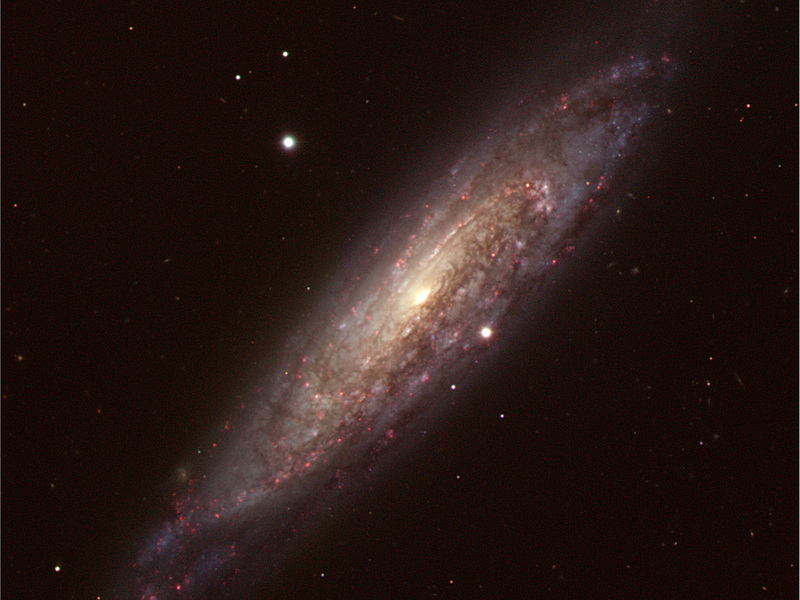 NGC 134 is a barred spiral with its spiral arms loosely wrapped around a bright, bar-shaped central region. The red features lounging along its spiral arms are glowing clouds of hot gas in which stars are forming, so-called HII regions. The galaxy also shows prominent dark lanes of dust across the disc, obscuring part of the galaxy's starlight. 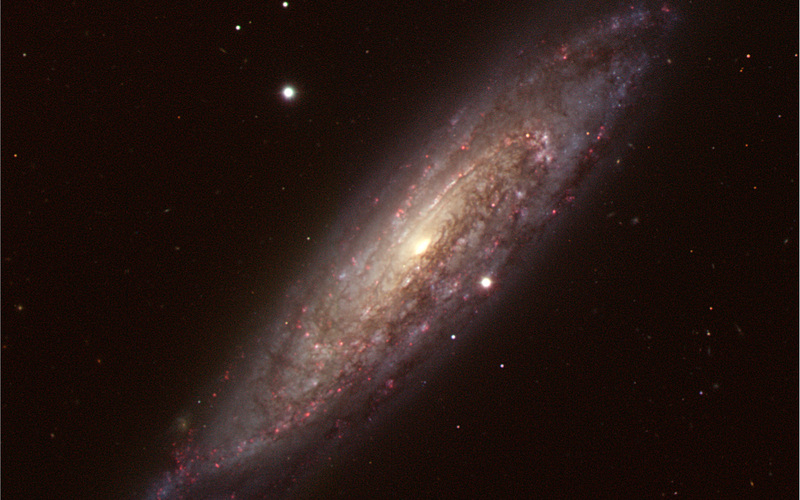 The image is a colour composite based on data obtained in the B, V, R, and H- filters with the FORS2 instrument attached to Antu, UT1 of the VLT. 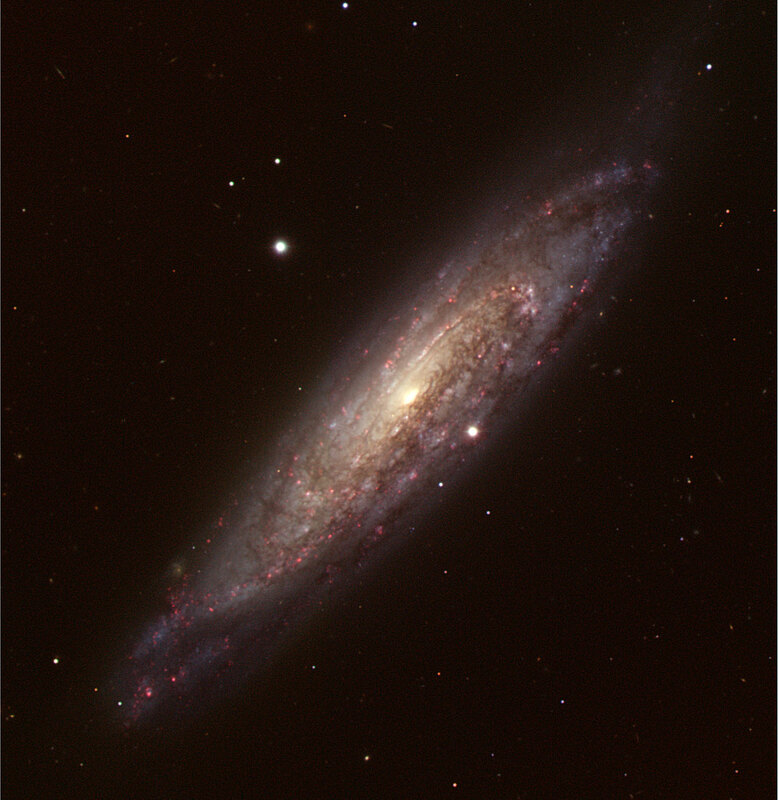 During his stay on Paranal, the Commissioner, together with the observatory staff, prepared the observations of this Galaxy. At night, Janez Potocnik initiated these observations, and checked the quality of the images as they appeared on the control screens. Because the high-sensitivity detectors used on the VLT measure only the intensity of the light reaching their pixels, the colour information is acquired by taking a sequence of images through different coloured filters. Consequently, the Commissioner could not immediately see the attached image, but only black-and-white version of it. The final colour processing was done by Haennes Heyer and Henri Boffin, with input from Yuri Beletsky (all ESO). Position (Dec): -33° 14' 35.41"